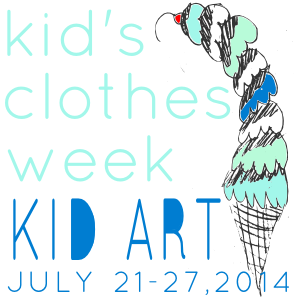 Well here we are, it’s the end of another Kid's Clothes Week. I’ve really enjoyed it but I’m glad it’s come to an end. Now that it’s all over I plan to clean my sewing space, have a wee bit a of a de-stash – and then, when the dust settles, embark on some sewing for me! Thank you for all your support during this KCW. I’ve had some lovely comments and messages from friends, other sewers and bloggers and other KCW participants. I’ve felt quite proud of what I’ve achieved – but also a little embarrassed of my sewing geekery/ obsession! It’s a weird combination. My husband was away for the first half of the week, and I felt like I needed to apologise to him every time I stepped away to sew… “It’s the second to last day” … “I don’t normally sew this much” … But he seemed unfazed and very supportive - even yesterday saying: “Do you need some more fabric? Shall we go to Spotlight?” “You don’t want all your projects to look the same because you’re using the same fabric!” – He obviously hasn’t seen the exploding stash in my sewing room! On the topic of using the same fabric – this is exactly what I’ve done today. But when it’s gorgeous cat fabric (bought from here); exceptions can be made, right? Besides, these sweatshirts aren’t for my kids they are for a little friend of ours. (I sewed 2 days each for my kids, I thought it fitting the last day be for someone else). Once again the pattern I used the brilliant The Street smart Sweatshirt Collection by Little Kiwi's Closet. This time in a size 2years. And once again (like yesterday) I was racing daylight to get it finished in time and photographed … The actual sewing took 1 hour total but the tracing the pattern, cutting them out and general phaffing about took a little longer! Due to the hurried taking of these pics please excuse the loose thread hanging out of the sleeve in that last pic – you can’t take your eyes off it now, right? For the cat pocket sweatshirt, the grey fabric is from a whole pile of grey sweat shirting I picked from the op shop the other day for next to nothing and the red check is from Spotlight. Well, I don’t know about you but I’m going have a nice cup of tea and a lie down now (and some dark Ghana peppermint chocolate).